Turn up or turn down the "heat" of these fast'n'easy tortillas by adjusting the amount of jalapeno pepper you add. Combine lime juice, chili powder, garlic, pepper, and ground cumin in medium bowl. Add chicken strips and toss; set aside for 5 to 10 minutes, stirring occasionally. Heat oil in sauté pan over medium-high heat. Add bell peppers, onion, and jalapeno pepper; cook, stirring occasionally, for 4 minutes or until peppers are crisp-tender. Add chicken mixture with lime juice marinade; cook, stirring occasionally, for about 5 minutes or until chicken is thoroughly cooked and vegetables are softened. Taste and adjust seasoning. To serve, place warm tortillas on plate; cover to keep warm. Spoon chicken-vegetable mixture into bowl. 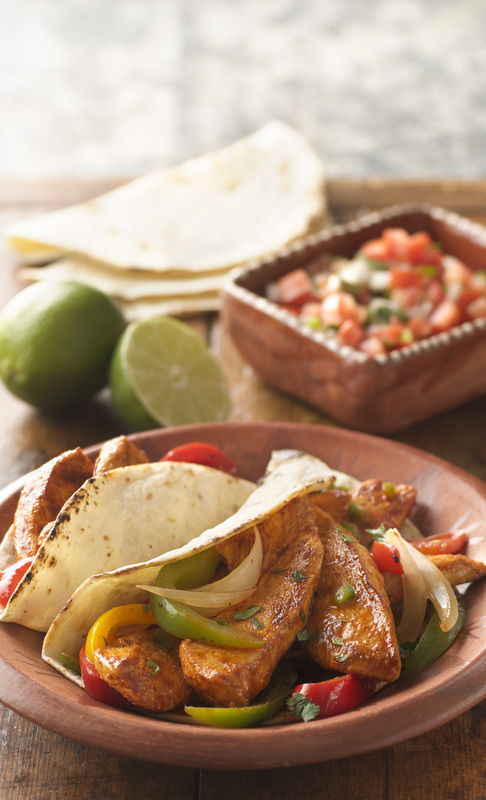 Assemble fajitas as you eat by spooning some of chicken mixture into center third of each tortilla and rolling sides. When handling jalapeño peppers, wear plastic gloves! 1 teaspoon jarred minced garlic may be substituted for minced fresh garlic.